No physical basis -- just numerology. Originally, only the first six planets were known -- Uranus's discovery (1781) "confirmed" the law. Neptune and Pluto shed doubt on Bode's "law." It is now simply a curious (and flawed) coincidence. So is there a planet between Mars and Jupiter? 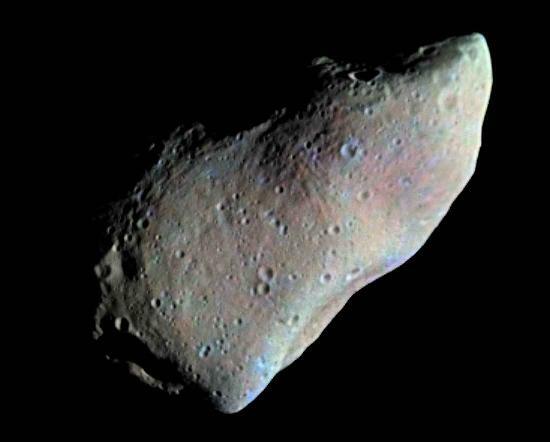 Search led to the discovery of small rocky bodies known as asteroids! physics: where would the energy come from? properties: total mass < mass of Moon. Better idea: Leftovers from early solar system, unable to coalesce into a planet because of Jupiter's gravity. For a long time we had very little idea what the surface of asteroids looked like -- too small, too far away. Other asteroids do, too. 10-30% of asteroids may have sizable moons (even bigger than Dactyl).